More than 30 years ago, Kenneth Lyons Jones, M.D., pediatrician and pioneering specialist in the study of birth defects, helped identify what is now commonly known as fetal alcohol syndrome (FAS). This ground-breaking research established the link between alcohol use, pregnancy and birth defects. Now, Jones has received a grant from The Hartwell Foundation to examine another possible link: poor diet, pregnancy, and birth defects. “Birth defects are dropping world-wide, with a few exceptions, such as gastroschisis, a serious congenital defect of the infant’s abdominal wall that requires major surgery immediately following birth. This defect may be caused by a poor, ‘fast-food’-style, pre-packaged Western diet,” said Jones, chief of the division of dysmorphology and teratology in the department of pediatrics, UC San Diego School of Medicine. Jones is one of only twelve investigators chosen by The Hartwell Foundation to receive a Hartwell Biomedical Research Award. The grant covers direct costs of $100,000 per year for three years. The goal of Jones’s research proposal, “Maternal Dietary Fat Intake as a Potentially Preventable Cause of Gastroschisis,” is to determine whether or not some changes in diet could prevent a certain birth defect. In California, gastroschisis occurs in five out of every 10,000 births and is typically seen in the newborns of young mothers, under the age of 21, who fall in a low socio-economic demographic. The study team will further examine unique fat deposits found in the placental membranes of children born with gastroschisis. Some years ago, Jones’ colleague, Kurt Benirschke, M.D., professor emeritus at UCSD School of Medicine, discovered these unique droplets, found exclusively in the placental membranes of newborns with gastroschisis. Another colleague, Lee Hagey, Ph.D., associate project scientist, UC San Diego’s Department of Medicine, documented that those deposits were packed with a fat rarely found in the human body: very high in non-essential fatty acids, very low in polyunsaturated essential fatty acids. Jones’ team will recruit women early in their pregnancies, at 18 to 19 weeks gestation. Then, the team will examine and compare 10 women with babies born with gastroschisis and 10 with babies born without it. Among his many contributions to the field of dysmorphology, Jones is a founder of the California Teratogen Information Service, based at the University of California, San Diego School of Medicine. CTIS’s mission is to eliminate preventable birth defects, using research and education to promote healthy pregnancies. Jones says that even though this study is in the very early stage, its potential is similar to that of previous studies involving folic acid. Some years ago, research showed that pregnant women who were at risk of having babies with neural tube defects could markedly decrease this possibility simply by adding folic acid to their diet. Jones’ research has focused on dysmorphology, the study of birth defects, particularly those affecting the anatomy of the individual; identifying the mechanisms of normal and abnormal fetal development; and the recognition of new human teratogens (birth defect-causing agents). He is the author of more than 400 publications in scientific journals, as well as several books. His book, Smith’s Recognizable Patterns of Human Malformation, is the reference used by health care professionals to assist in the diagnosis and management of individuals with birth defects and genetic conditions. 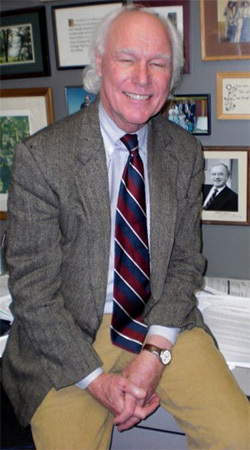 Jones was one of 17 UC San Diego physicians named in America's Top Doctors, National 2002, published by Castle Connolly Medical Ltd.
Jones will collaborate with the laboratory of Carl Keen, M.D., University of California, Davis, which has made many of the cutting-edge observations on the role played by micronutrients in fetal development. Project team members include Jones, Keen, Lee Hagey, Ph.D., associate project scientist, in UC San Diego’s Department of Medicine; and Christina Chambers, Ph.D., M.P.H., associate professor-in-residence at UC San Diego’s Department of Pediatrics. The primary mission of The Hartwell Foundation is to provide financial support to individual researchers in the United States for innovative and cutting-edge applied biomedical research aimed at benefiting children. The general aim is to provide funds for early stage research projects that have not yet qualified for funding from traditional sources. In making Individual Biomedical Research Awards, The Hartwell Foundation takes into account the nature of the proposed innovation, the extent to which translational approaches will promote rapid clinical application of the research results, the supportive role of collaboration, and the institutional commitment to provide encouragement and technical support.